40% of respondents would recommend this to a friend. We recommend checking out our discussion threads on the Elvid OCM-10-PSM FieldVision 10.1" Pro IPS LCD OCM-10-PSM, which address similar problems with connecting and setting up Production Monitors Elvid. 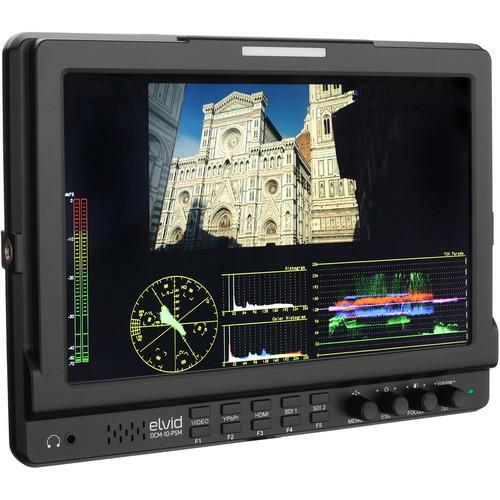 The user manual for the Elvid OCM-10-PSM FieldVision 10.1" Pro IPS LCD OCM-10-PSM provides necessary instructions for the proper use of the product Professional Video - Monitors - Production Monitors. The Elvid OCM-10-PSM FieldVision 10.1" Pro IPS LCD Monitor with Scopes is a compact battery powered field monitor with a 16:10 native aspect ratio, and a wide variety of signal scopes that allows you to customize your display to suit changing needs depending on the job. It features a mode that tiles histogram, audio bar, vector, RGB histogram, and YUV waveform in a border surrounding your video image, allowing you an unobstructed view of your video and scopes at the same time. The IPS panel features a native 1280 x 800 resolution that scales to fit HD and SD images, in NTSC and PAL, over SDI and HDMI connections. The monitor features two separate anamorphic modes, a 1.33 and a 2.0x squeeze, allowing you to view your footage unsqueezed, even if your camera doesn't unsqueeze the output. The monitor automatically detects and displays the signal, and provides a 178° viewing angle without noticeable color or contrast shift. You use the front mounted knobs to select which scopes you wish to display, as well as choose from a variety of safe area markers as well as peaking and zebras. You can select to display audio level meters on the side of the monitor if you wish, or monitor the audio from the built-in speaker or headphone jack. The monitor is powered from optional Sony L-type battery, 4-pin XLR connector, or 12 VDC coax input with the included power adapter. If you own a Elvid production monitors and have a user manual in electronic form, you can upload it to this website using the link on the right side of the screen. Box Dimensions (LxWxH) 11.6 x 11.5 x 3.5"
The user manual for the Elvid OCM-10-PSM FieldVision 10.1" Pro IPS LCD OCM-10-PSM can be downloaded in .pdf format if it did not come with your new production monitors, although the seller is required to supply one. It is also quite common that customers throw out the user manual with the box, or put the CD away somewhere and then can’t find it. That’s why we and other Elvid users keep a unique electronic library for Elvid production monitorss, where you can use our link to download the user manual for the Elvid OCM-10-PSM FieldVision 10.1" Pro IPS LCD OCM-10-PSM. The user manual lists all of the functions of the Elvid OCM-10-PSM FieldVision 10.1" Pro IPS LCD OCM-10-PSM, all the basic and advanced features and tells you how to use the production monitors. The manual also provides troubleshooting for common problems. Even greater detail is provided by the service manual, which is not typically shipped with the product, but which can often be downloaded from Elvid service. If you want to help expand our database, you can upload a link to this website to download a user manual or service manual, ideally in .pdf format. These pages are created by you – users of the Elvid OCM-10-PSM FieldVision 10.1" Pro IPS LCD OCM-10-PSM. User manuals are also available on the Elvid website under Professional Video - Monitors - Production Monitors.